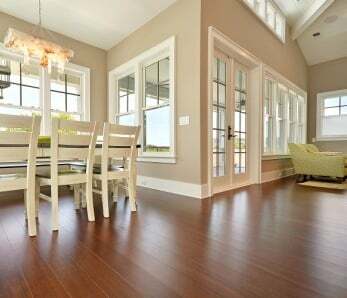 If you’re in the market for new floors that are beautiful, durable, and affordable, then you may want to learn more about bamboo flooring. 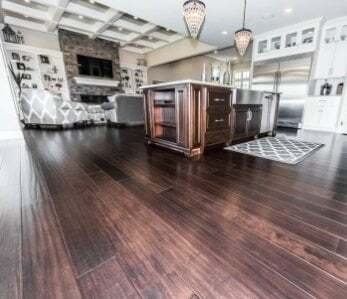 Before getting into what bamboo is exactly and explaining how it’s made, we do want to suggest that when you purchase your new bamboo floors you select quality flooring that comes from a reputable manufacturer. 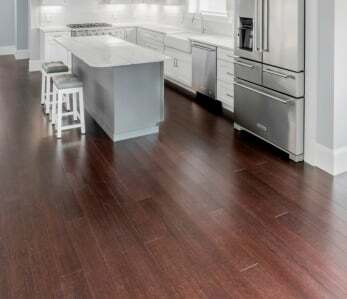 This way you can ensure the flooring has not only been harvested in an eco-friendly manner but has also been produced in a way that is as good for the environment as it is for the consumer. So What Exactly is Bamboo? Bamboo is often lumped into the hardwood category but it is actually a tall grass not a hardwood tree at all. Bamboo is a sustainable plant that grows quite quickly (up to four feet per day) and regenerates quickly as well (in as little as 3-5 years) and that has made it an industry favorite as an environmentally friendly “wood” flooring. Another reason that bamboo is considered environmentally friendly is because the most common form of bamboo is self-propagating and does not require herbicides or pesticides to flourish. While typically found in Asia, it is becoming a more common crop around the world, with close to 1,000 various species thriving in myriad soils and climates. Most hardwood trees take literal decades (30 – 100 years) to get to the point where they can be harvested. But bamboo, on the other hand, can be harvested in as little as three – six years. I think you’ll agree that’s quite a difference. Harvesting the bamboo does not damage the grass. On the contrary, much like the grass in your yard, the bamboo remains healthy and continues to grow and produce future crops. Harvesting the bamboo is the easy part of the whole manufacturing process. Transforming this grass into durable flooring is where the work really begins. First – the green outer hull of the bamboo is removed, then the inner stalk is cut into long strips. The strips will still have the curved edges of the bamboo stalk, and so these edges must be milled to make the flat strips that make the recognizable flooring planks. These strips are completely dried and then boiled, which removes the natural sugars and starches (you know, the stuff that makes bamboo taste so good to pandas). Not only does the boiling process remove the sugars and starches, it also makes the finished product less desirable to insects like termites that often cause destruction in traditional wood floors. 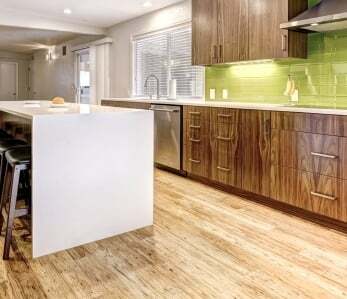 Boiling also makes the bamboo less likely to expand and contract when installed in humid climates, which gives it another leg up on traditional hardwood floors. Once the boiling and drying has been completed the bamboo strips can be darkened through a process called carbonization. 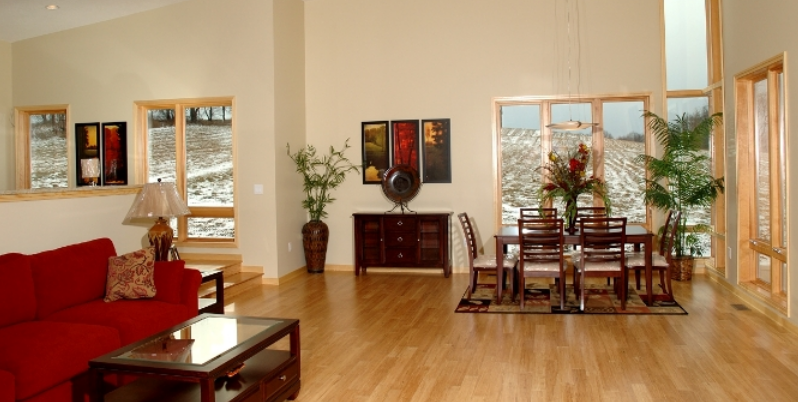 This process gives the naturally-light colored planks a color closer to hardwood floors. The process of carbonization uses steam and pressure to darken the bamboo, from shades of deep coffee to a light amber. Bamboo is also lovely in its natural color, and many homeowners choose to keep it natural or stain it any color of their choosing. Once the initial refinements are completed, the bamboo is then inspected and receives a grade of either A or B. Remember all of those trimmings that happened during the milling stage? Well all of those trimmings, or strands, don’t get wasted and thrown out – on the contrary – they are woven into intricate patterns and then compressed with a resin. 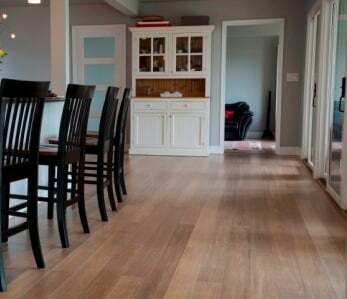 The result is a gorgeous and incredibly durable floor that is scratch-resistant, UV resistant, moisture-resistant, and is about twice as strong as regular bamboo flooring. After the boiling process, the strips are once again dried in a kiln. They are then glued together into either a vertical or horizontal grain pattern. For vertical grain bamboo flooring, the narrow edges of several strips are glued together with a thin layer of lamination between them. 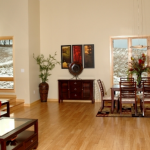 When completed, the flooring has a smooth look very similar to traditional hardwood flooring. When the wider surfaces of the strips are glued together, face up, horizontal bamboo flooring is created. This process also uses lamination. When the flooring is finished it has a lovely and unique pattern because of the random display of the knuckles and growth rings of the bamboo stalk. No matter if it is strand-woven, vertical grain or horizontal grain, all three must go through a final stage where the boards are milled and refined. This is where the popular tongue and groove are created for easy installment by customers, and also where multiple coats of finish are applied to make the planks resistant to damage from daily use. Now that you know , it is, hopefully, easier to understand just how a tall grass can be transformed into one of the most durable and eco-friendly flooring materials out there. If you’re in the market for new flooring, consider bamboo, a wonderful alternative to the more traditional hardwood floors.